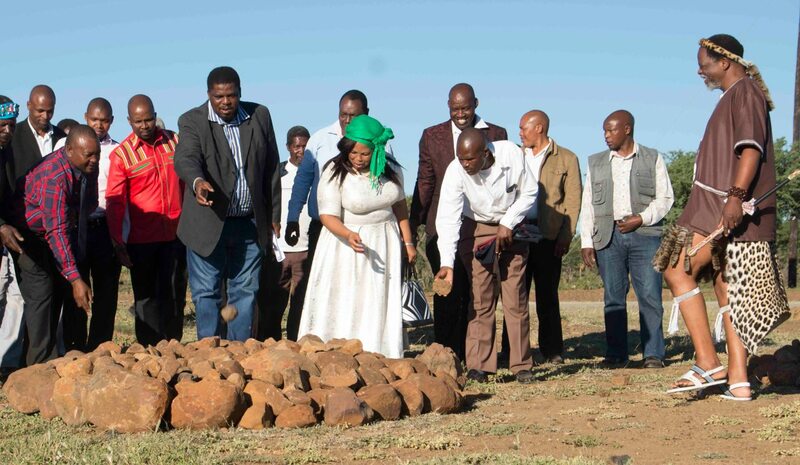 The tide of history flowed on a farm in Msinga on the Monday before Human Rights Day, lifting the spirits of the people of Ncunjane as they took possession of a title deed that stated incontrovertibly that the future was now theirs. By YVES VANDERHAEGHEN. “Broken-hearted people,” said one speaker at the ceremony, “have reason to rejoice”. Or was it that the colonial tide had ebbed, leaving behind a way of life imagined, where the relations between the land, the people, the river down below and the blue skies above were coherent, sensible, settled? Amid the ebb and flow there have been few constants. Of one there is certainty. In 1864, long after the Bushmen had been driven from the area, when the king-to-be Cetshwayo ruled the Zulus in lieu of his corpulent father Mpande, when Victoria had mostly leached the globe to an imperial pink, not too long after Nongqawuse bled the cows of the Xhosa to purge the land of colonisers, and not too long before the victory rolls of Isandlwana waned into the death rattle of a nation, in that year a surveyor staked the ground that would be called Koornspruit farm on the map. It still bears that name, forming part of the Ncunjane isigodi. It is this farm and its neighbour, Spring farm, whose names appear on the title deeds presented to Inkosi Ngangangandlovu Mchunu, under whose authority the land falls, witnessed by Inkosi Sphamandla Mvelase of the neighbouring abaThembu, indunas, and the men, women and children who have settled here. For this is settler country. But with a twist. The settlers have been, among others, the fugitive tribes of the amaChunu and the abaThembu, who sought refuge here from Shaka. And while the map shows that farmers by the name of Buys, Boshoff, Acutt, and Meyer settled here, they had never lived on these farms. It is only now, 143 years after Koornspruit was first surveyed, that the owners are the people who live on it. The passage to ownership via what was a successful land restitution claim has not been straightforward. These dry thornscrub farms, overlooking the mighty Tugela River in the distance, form part of what Secretary for Native Affairs Theophilus Shepstone considered at first wasteland, then labour reserves and winter grazing parcelled out to farmers as a buffer zone between Native Trust lands and the commercial farms of English and Boers. It was a fluid zone that Shepstone used as a barrier to prevent the white settlers from making further land grabs in the African areas, while at the same time manoeuvring to extend the crowded areas of tribal authority against strong resistance. Pity the cartographer tasked with flattening a quantum universe of flux, nation, pride, identity and survival into a few lines on paper that lock all human ambition behind a pencil boundary that says “you belong here, and you belong there”. Venality and quarrelsomeness aside, boundaries – visible and invisible, whether drawn up by the colonial administration or through tribal understanding – which cut people off from fertile lands, forced an impossible choice between starvation and combat. Authorities were warning of simmering boundary tensions from as early as 1851. A century of skirmishes and pitched battles eventually cascaded onto the tribal boundary that cuts through Ncunjane, between amaChunu and baThembu. As local historian Creina Alcock writes, trouble had been coming: “Mthembu people were steadily enlarging their fields onto what was considered Mchunu territory. At issue was the status of farm land. If you were a tenant living on a farm, could you ignore the invisible tribal boundaries? Tensions came to a head in September 1944 when six Mchunu were killed at a wedding on a farm in the Mthembu area. Three weeks later 6,000 men clashed in what has been described as ‘the biggest battle ever fought since the Anglo-Zulu war’.” The Gongolo war, as it is known, claimed 66 lives. Conflicts between the abaThembu and amaChunu, within tribes, and between farm communities and Location residents became endemic, for which the catch-all term “faction fighting” came to be used. Old resentments kept getting topped up with new ones, and Apartheid’s forced removals in the 1960s tore apart what was left of many fragile relations in the countryside. In 1969 the five families living on Koornspruit were removed, leaving the farm empty for the better part of 10 years, eventually to be claimed by a new generation of fugitives seeking a foothold on life. Who would want this broken land? Who would have the courage or foresight to turn the tide of blood into a sanctuary of hope? In 1975 Anglo-American stumped up the money to buy adjoining farms Koornspruit, Spring and Lorraine for the Church Agricultural Project, which on the initiative of farmer-philanthropist Neil Alcock wanted the land held in trust on behalf of local communities until such time as democracy and new laws would allow them to take ownership themselves. Nearly 47 years later, that time has finally come to pass, but amid a land debate riven by ideological confusion and administrative lassitude and incompetence, the result of which is that apartheid geography, tenuous tenure and the stranglehold of big farmers over small, remains largely unchanged. Therefore the joyousness of last Monday’s ceremony to hand over the title deeds was tempered by wisdom born of an intimate knowledge of the tensions of the area and warnings from the patchy history of land reform. A clue to how this deal has attempted to sidestep some of the pitfalls of land reform lies in the deed of title itself. Since 2000, much land that is claimed to have been returned to community ownership is in fact “owned” by the Department of Public Works, with the nominal “owners”, or the beneficiaries, reduced to the role of lessees, whose security is now increasingly being held hostage to making a commercial go of their “property”. If not, it gets confiscated for someone else to have a crack at it, a far cry from what anyone understands by “restitution”. Tribal authorities, on the other hand, have been trying to muscle in on the act by wanting title to be in their name. The Ncunjane title deed is in the name of a trust, with trustees coming from the 83 people currently living on the farms, and with Inkosi Mchunu as the honorary chairperson. Their responsibilities are weighty. One thing that will have to be sorted out is the old question of boundaries, since the surveyor’s boundaries do not coincide with tribal boundaries, which tend to slide over and around fencelines. As Rauri Alcock, director of the Mdukatshani Development Project that works in the area, said at the ceremony: “I remind you of them. We need to respect boundaries.” He also warned that the decisions of who, other than the new owners, is allowed to settle on the land is now up to these owners. “I hope the chief will protect you,” he added, “when people come to take your land,” a reference both to informal residents such as extended family, but also to the encroachment of covetous neighbours who may need extra grazing or fields to plough. This is not bountiful land, and what it yields it only does under careful tending. The recent years of drought have made even this little, that much harder, as cattle herds have been obliterated and this year’s grass offers little hope for winter grazing. “We also need the co-operation of the politicians,” he said, even as he made a pointed appeal to the mayor, who was present, “not to run away and build fancy houses and leave the people behind”. The indunas also have their part, said Mchunu in warning. For example, “if someone from the outside, who was removed, wants to come back, they must go to the trust so that the induna can decide. The induna can’t do what he wants … the land belongs to the people and he must consult the trust.” Above all, “follow the rules”, he said, adding that “the Mchunu abide by the Traditional Authorities Act”. Thanks to Creina Alcock and Rauri Alcock for the historical information on the area, and to Ben Dladla for translating the speeches.